When you think of salsa what comes to mind? Does it involve tomatoes, onions, and peppers, a cold beer and a bag of tortilla chips? Chips and salsa make a great appetizer for any tailgate or entertaining event. When it comes to a fresh fruit salsa, it can be used for so much more than just a bag of chips. This Fresh Cherry Salsa is the perfect condiment for a summer appetizer or grilled entree. Thinking appetizer? Try toasting butter-covered slices of a french baguette. Spread on soft cream cheese and finish it off with Fresh Cherry Salsa. 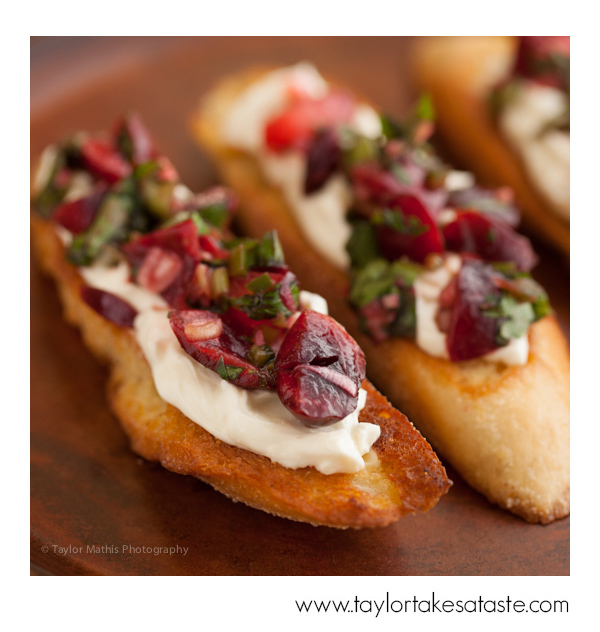 This Fresh Cherry Salsa Crostini is an easy appetizer that everyone at your party will love! Thinking more a long the lines of a main entree? 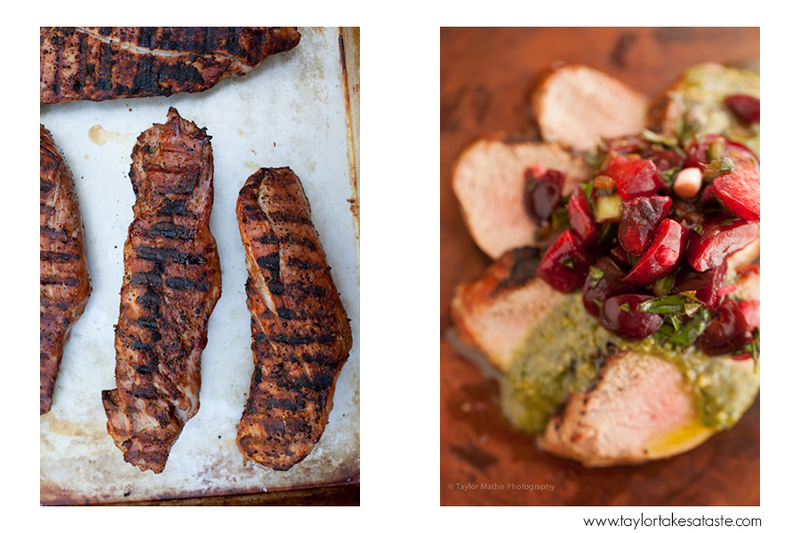 Serve the salsa over pork tenderloin or grilled chicken. If you are planning on taking your salsa on location, you can prepare it the night before, refrigerate it overnight, and then take it in a cooler to your tailgate, picnic, or family reunion. 1. In a medium bowl add the cherries and plumcots. Toss to mix. Add the scallions, basil, parsley, red onion and peppers. Toss to mix. Add the lime juice, sugar, garlic, salt, lime zest and bitters. Gently toss mixture. Cover bowl and chill salsa for one hour. Serve. I love the new look of the website! It looks great! I’m still thinking about the lime cheesecake with fresh blueberry sauce from the previous post. Forget red, white and blue food (unless it’s the famous Mac-n-Cheese) for the Fourth of July, I’m going for the cheesecake!